Do They Know It’s Christmas? | IT'S HAPPENING IN HEELEY! 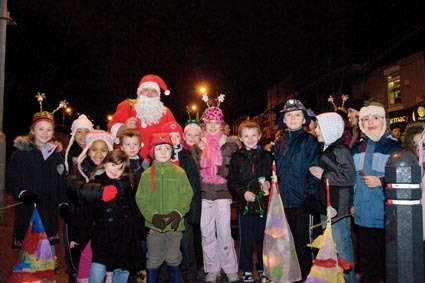 Since 2001, Heeley Green has seen locals gather to mark the beginning of Christmas with a Lantern Parade. Children make lanterns at school, then on the first Friday of December they are lit, the Christmas lights are switched on, and a swarm of Heeley-ites process towards Heeley Parish Church for a carol service. But not this year. ‘The event costs a minimum of £2800 just to put up the lights on Heeley Green. There are further costs, roughly £500, for artists working with local children to make the lanterns; money for a brass band; PA system and publicity. The cost of the lights has traditionally been covered by the Area Assembly and Area Panel before that. The Trust would have been able to raise the usual £500, but to secure the main funding was not possible. It’s a real shame it’s not a priority’. Father Christmas pays an early visit to Heeley Green, 2009. Local shopkeepers, too, were disappointed to hear that 2011’s festivities had been cancelled. Mrs C Smith of Premier Grocers felt “we’re a forgotten community at Heeley”, and Sam of Bradley’s Cafe told the Voice, “all the shopkeepers used to chip in…. I can’t put down what I really want to say!”. So, what are the prospects for a return of seasonal cheer to Heeley Green in December 2012? Our local Development Trust and its HEAT team are working to capacity, but there is a willingness among local people to contribute, and some new ideas to consider: “Maybe a Christmas tree instead?” suggested one local, Bardy McNair. Martin Hughes offered some hope, saying, “Councillors may choose to set aside a budget for community festivals in 2012/13. I also intend to work with groups and shopkeepers in Heeley to explore options for storing the lights locally, looking for cheaper installation options, contributions from shopkeepers, etc.”. (0114 250 0613 or voice@heeleydevtrust.com). Or to offer help, contact the HEAT Team (0114 250 0613 or maxine.b@heeleydevtrust.com).